It doesn’t matter when you were born, everyone has got to be familiar with the world of Jurassic Park, or even the newer movies like Jurassic World. The Jurassic franchise is almost the mandatory introduction to dinosaurs these days, and many people have grown up watching these movies and wanting more from these mystical yet very intriguing creatures that once roamed the planet before us. While we have found many fossils over the years and have somewhat of an idea of what type of dinosaurs used to live on this planet before us, it’s been so extremely long since then that the dinosaur is an interesting creature to use for movies and video games. 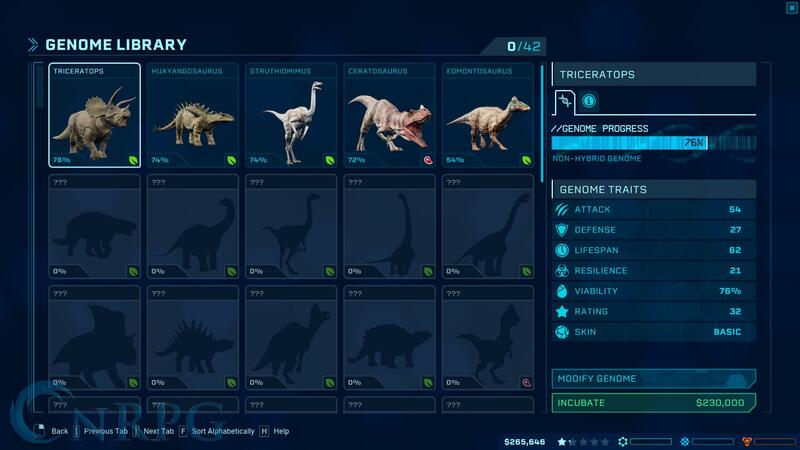 While Jurassic Park portrayed dinosaurs in a realistic world back then, Jurassic World and the game Jurassic World Evolution takes dinosaurs to a somewhat futuristic setting where we are able to enhance their genes to make a colorful zoo out of them. Jumping into the game you are immediately met with the classic Jurassic tune, and I couldn’t help myself and was humming along. 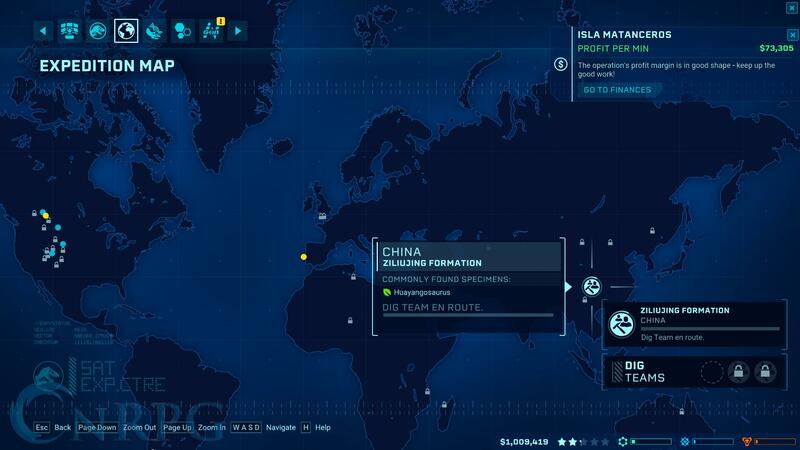 Jurassic Park, and now Jurassic World, have this very rich story with almost an endless amount of possibilities that haven’t really been explored yet in movies and games. This is what makes it a lot more interesting; Jurassic World Evolution or the movies isn’t just another movie or game that takes place in some fantasy middle earth setting, with humans, orcs and elves fighting each other, because what else could we possibly make in a fantasy setting? Anyway, before I start writing an entire book on how I love dinosaurs and everything around it, let’s jump into the game! 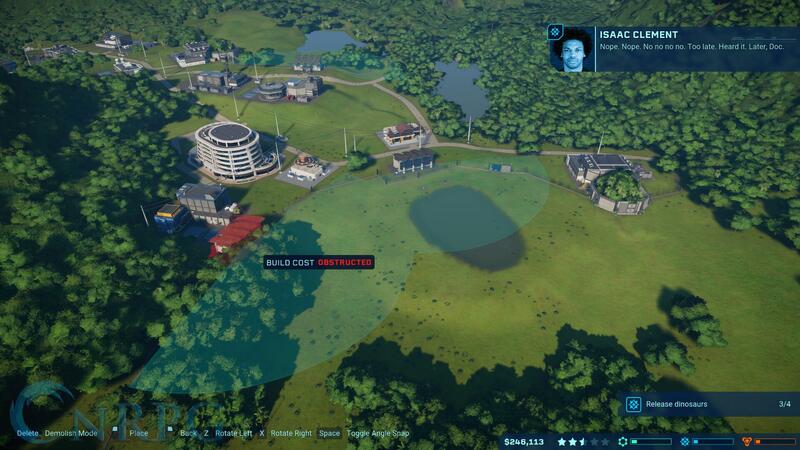 Jurassic World Evolution is a game where you build a zoo, and slowly open up the doors to the bigger and scarier dinosaurs for the tourists to check them out. As you can imagine this should be done gradually, slowly, and safely, so you know the house of cards doesn’t come crumbling all down when something happens in your park. 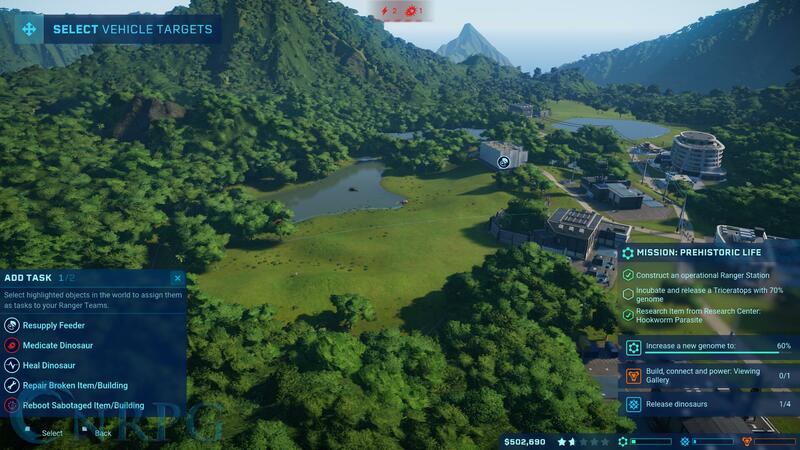 To let the player gradually learn about the dangers of dinosaurs, and the islands you get to build the parks on, you will start on the island Isla Matanceros, where the weather is nice and a lot of the key structures are in place already. 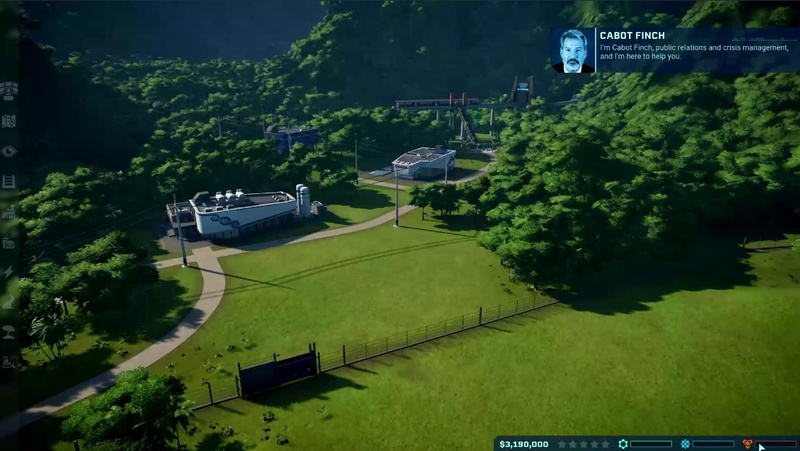 You should see this island as your tutorial, as to here you will get to know some of the dinosaurs, and what most of the basic structures do, in order to get your park going and make a profit. 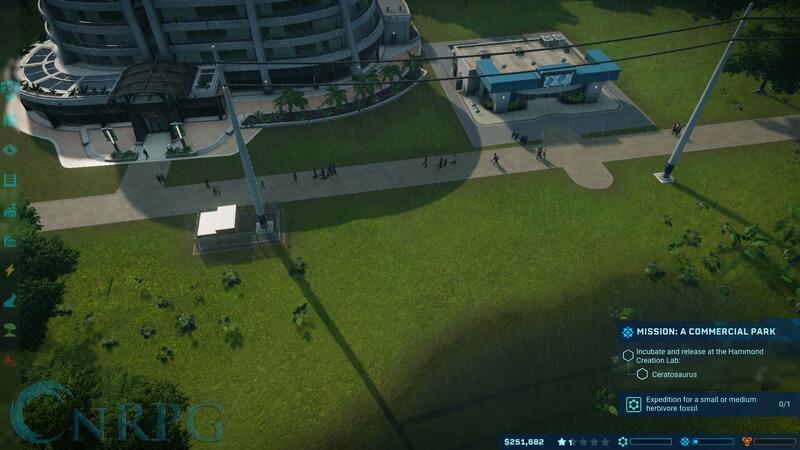 Since you are managing and operating a park, you need to earn a profit to keep the lights on and the dinosaurs fed. This is where focusing on entertainment takes a big role in making sure the cash is always flowing in, instead of slowly dripping out. While having a park with fenced in dinosaurs can be nice, if there are no restaurants, shops, or even a hotel, no one is really gonna bother visiting. Just like the dinosaurs, people also need to be fed and given a temporary home while they visit the wonders of your park. 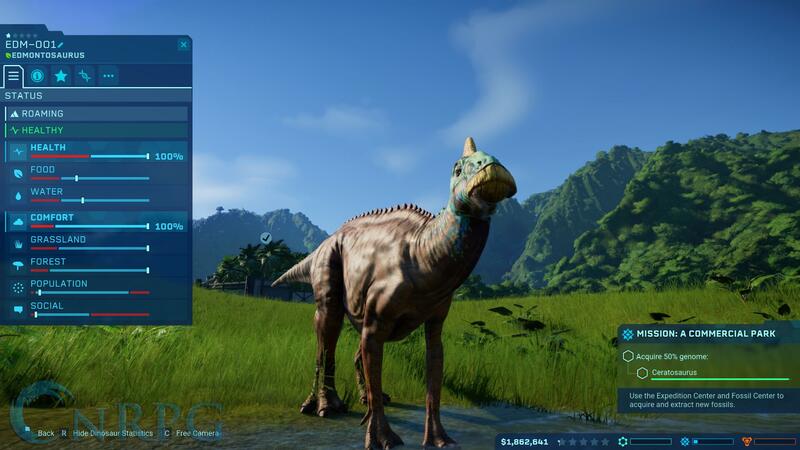 Incubating normal and simple dinosaurs isn’t what is going keep the park interesting and make the people return for another vacation at your lovely park. 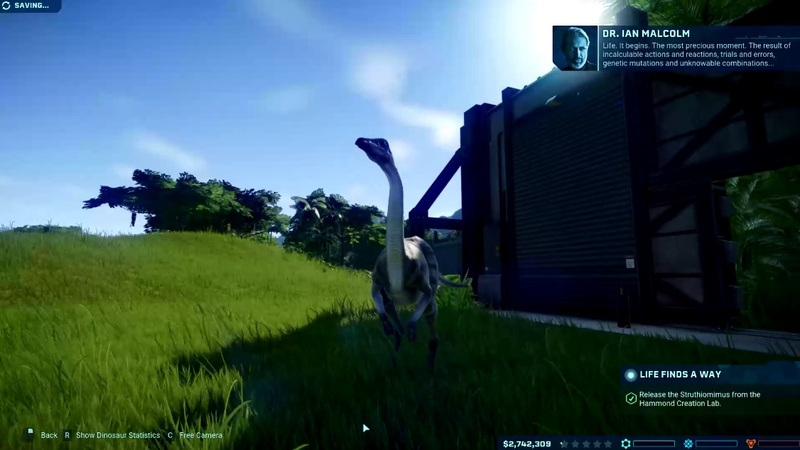 You also need to keep incubating new dinosaurs, preferably dinosaurs that get the adrenaline pumping for visitors. This is where the carnivores come in play. These meat-eating dinosaurs love making a show out of hunting their prey, and while you can let the rangers give them just simple meat, you can also make the carnivores hunt for it. This is a crowd pleaser for people in the viewing galleries, but since they can only see a small area of your park, you have to make sure your customers can have a nice view of everything that takes place in the park. You can do this either by making the fenced off areas slightly smaller, or you can have them run around in the gyro balls, or how I’d like to call them, human hamster balls! 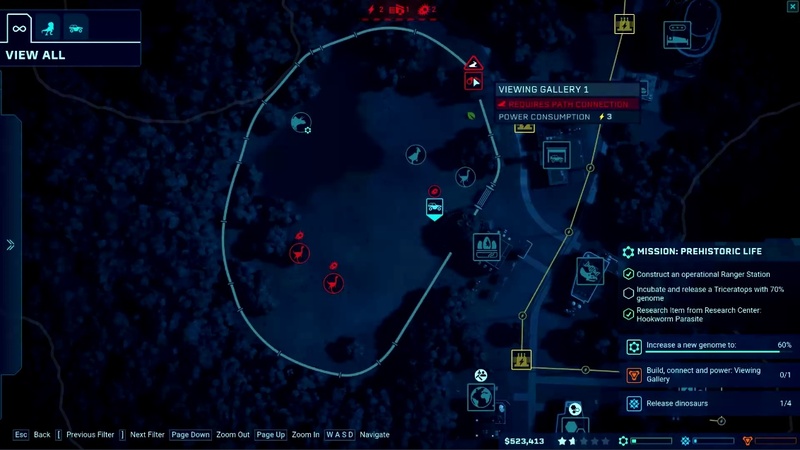 Getting started in a new park is easy, and depending on the island you’re on, you can have a very easy playthrough if you just want to play casually. While the game definitely opens up more after unlocking each island through doing missions and getting good ratings on previous parks, you can also stay on the first island and just move on from there whenever you please. 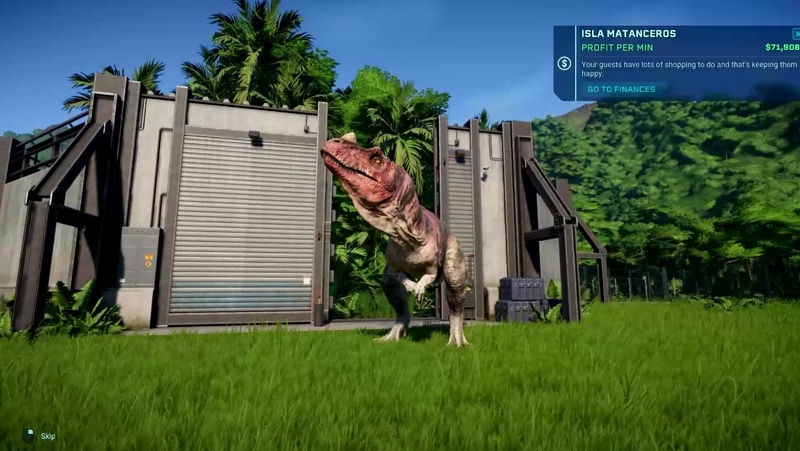 Besides upgrading your park, making sure power is running through each building, the dinosaurs are fed, and the people are pleased, you also get missions and contracts that you should see as challenges. 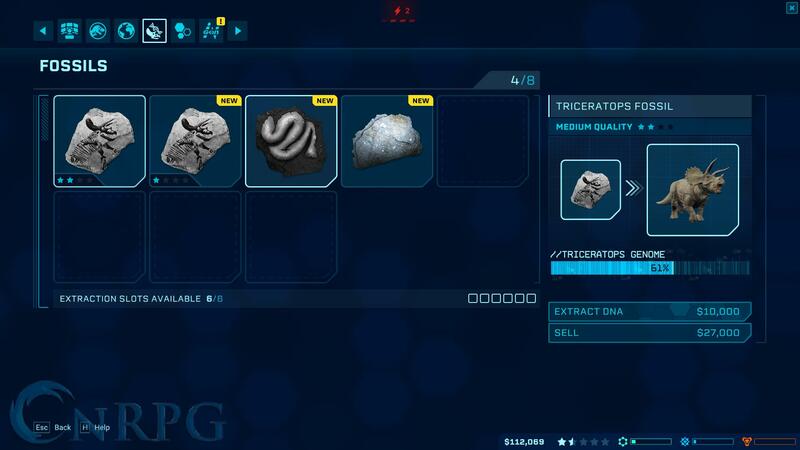 While some missions are very basic, like sending an expedition to find normal fossils that you sometimes have to incubate and let loose in your park, some are made to please your research centers, be it either for entertainment, security, or science. To spice things up, some of the islands also have dangerous storms which can damage the park and also endanger the people visiting the park. Naturally you will have to build precautionary defensive structures to make sure nothing dangerous happens while one of these storms flies over, unless they damage the park and set the dinosaur loose. 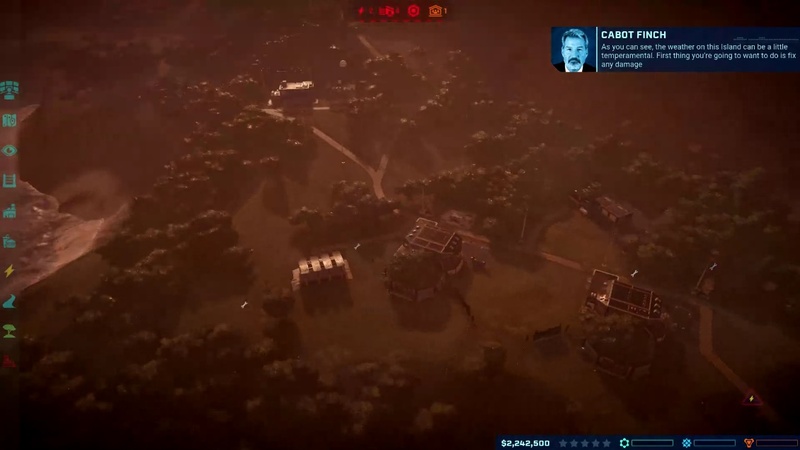 Jurassic World Evolution is visually and audibly a solid game that should be picked up by any Jurassic Park/World fan. While the game could have a little more depth to it, and the playable zones are somewhat small and could do to be doubled at least, the game in its current state is still a ton of fun. 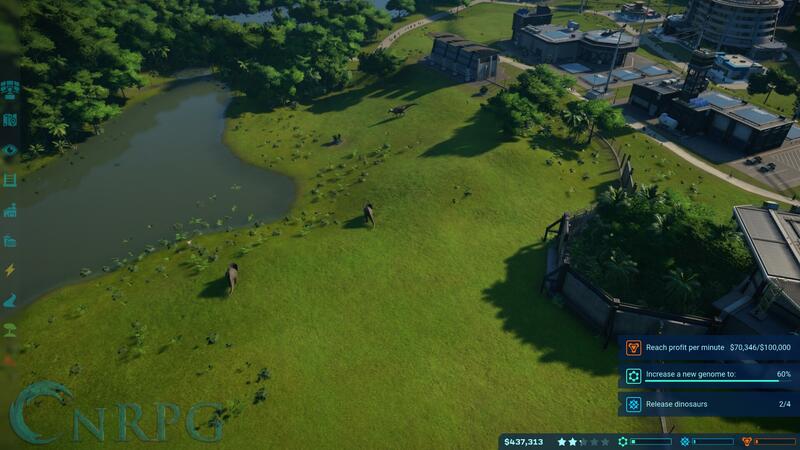 The game lets you create a zoo full of dinosaur extremely well, and while the islands are set in their limits, you can still let your creativity go loose on however you want to build your fenced off areas. Making sure the water, gas, and power keeps running is important, but the game still puts the incentive on dinosaurs and the people visiting the park. 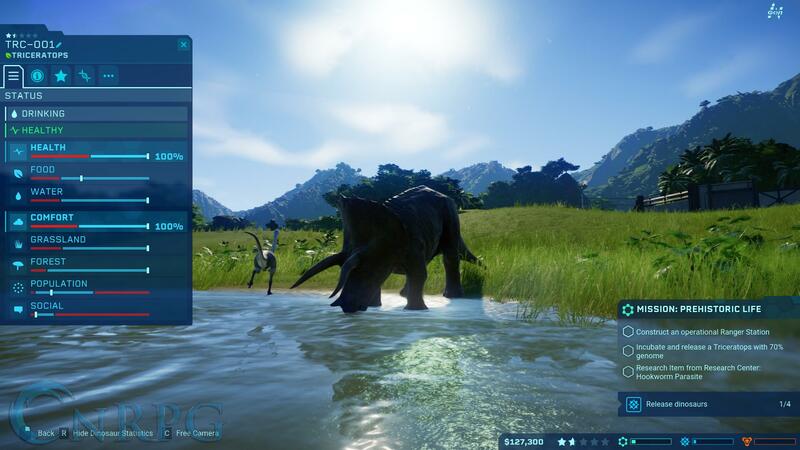 Jurassic World Evolution offers a sandbox type of experience, and even if you are just a fan of normal simulation games where you have to make sure the cash flow is positive, and the park keeps upgrading, Jurassic World Evolution is the right simulation experience you are looking for. Again, while the game could use some bigger playable areas, and it somewhat reminds me of the latest Sim City where the playable zones were fairly limited, the game play was still a lot of fun to make up for it.